Choose the General tab, if available. Not every version of the Settings app displays a General tab. Choose Battery from the list of categories on the left side of the screen. The number and variety of items listed on the Battery screen depend on what you’ve been doing between charges and how many apps you’re using. 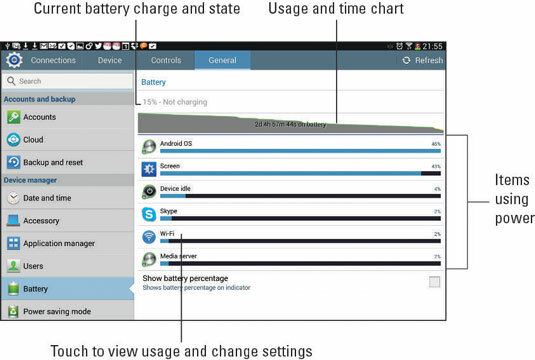 Carefully note which apps consume the most battery power. You can curb your use of these programs to conserve juice — though, honestly, your savings are negligible. You can touch any item listed on the Battery screen to see further details for that item. On the Use Details screen, you can review what is drawing power. Buttons are available on some screens that let you disable features that may be drawing too much power. Not everything you’ve done shows up on the Battery screen. For example, even after you read a Kindle book for about half an hour, Kindle may not show up. Also, the Gallery app may show up from time to time, even though you didn’t use it.